Tool to compute statistical measures of Precision and Recall. 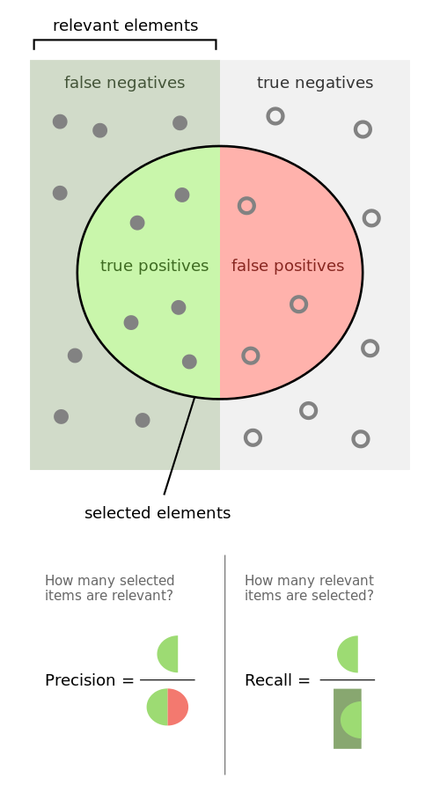 Precision and recall are two statistical measures which can evaluate sets of items, also called predictive value, specificity and sensitivity. Team dCode likes feedback and relevant comments; to get an answer give an email (not published). It is thanks to you that dCode has the best Precision and Recall tool. Thank you. > [News]: Discover the next version of dCode Precision and Recall! For a search, the precision is the ratio of the number of pertinent items found over the total number of items found. The recall is the ratio of the number of pertinent items found over the total number of relevant items. How to calculate F-measure (F1 score)? Which Venn diagram represents precision and recall? Improve the Precision and Recall page!